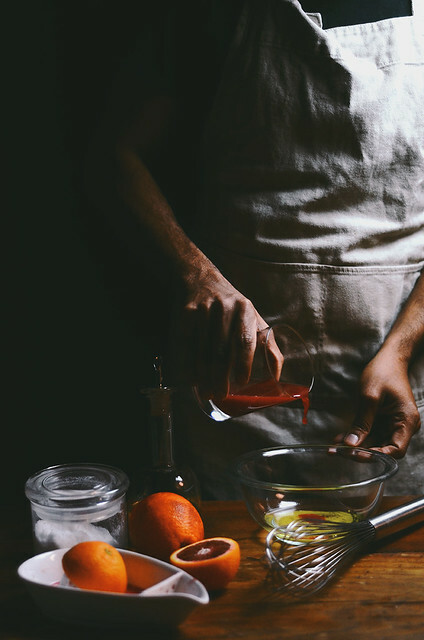 I think this might just be the final blood orange post of the year for me and this blog. 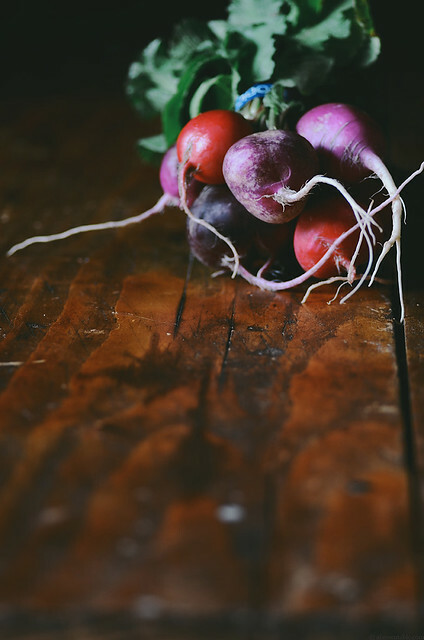 As per our favorite "dealer" at the farmer's market, the season is slowly coming to an end and this dream will too. This is one gift of winter, I'd like to keep on giving forever but then again, I guess I probably wouldn't appreciate them if they were available year round. Let's start with the meatballs and then get back to the aioli. My grandmother made meatballs often but we never ate them in sandwiches, they were always served as a small side with a bunch of other dishes. And I wish she had made us sandwiches because she did make the best meatballs! 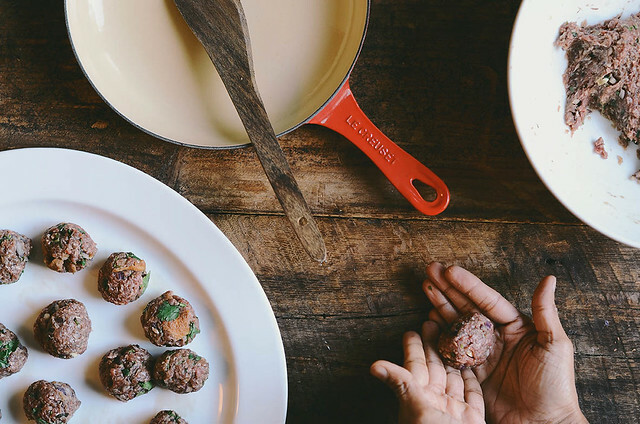 Her trick to making a good meatball that holds its shape, an egg and a few slices of bread soaked in milk and then squeezed. The combination of both of these together in meat makes a really great binding agent. My aioli turned out to be less pink and more yellow than I would like it to be but definitely had that distinct sweet citrusy flavor of the blood orange (reminded me of my blood orange curd experience). The color will depend on how red your oranges are. 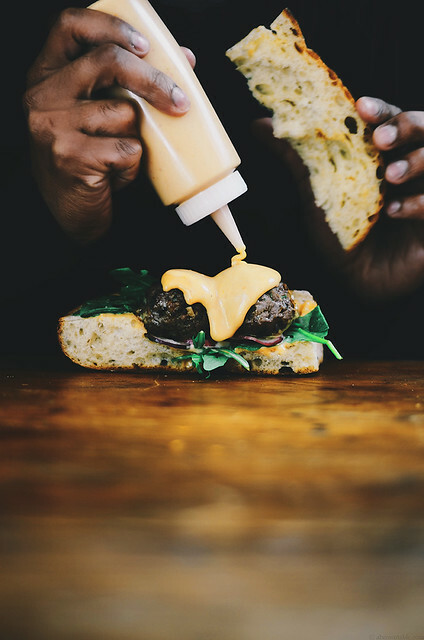 The reduction method helps to incorporate as much color and flavor you can squeeze into the aioli without affecting the ratios of the ingredients to create one thick and delicious creamy emulsion. You can use any bread to for the base of the sub and then stuff it up with your favorite greens and veggies. I'm not big on lettuce but I absolutely love arugula for its distinct peppery flavor which goes rather well with the spices that flavor the meatballs in this recipe. 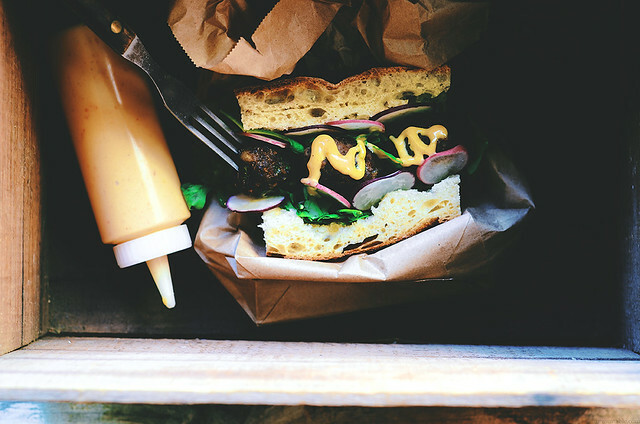 Layer the sub with a few slices of radishes and slather or drizzle with as much blood orange aioli as you want. The dried mushroom powder - I make my own. I just grind up a couple of dried mushrooms in a spice mill and use that use that to flavor meat. It's definitely a great way to keep a lean cut of meat juicy and enhance flavor, a trick I learned from the Mushroom Council last year in Philly. Aioli is a labor of love. I prefer to make it by hand with a whisk and a bowl (get the arm strength and stamina) versus the food processor. I mellowed the harshness of the garlic by using oven roasting it (you can find instructions here in this previous post), this also helped to have the orange flavor stand out. I recommend the reduction step to keep the water out of the aioli. Depending on how red your blood oranges are, you will end up with a pink or a more yellow aioli. I clearly had a more yellow aioli with a faint pink tinge. The addition of fresh orange zest gives this aioli a lovely bump of fresh citrus flavors. 1. In a large mixing bowl, add all the ingredients from the meat to the squeezed bread slices. Mix and combine with a large wooden spoon. Divide the mixture into 25 equal parts, each approximately 1 inch diameter in size. 2. To cook the meatballs: If frying - heat a large skillet with a 1-2 tablespoons of oil on medium-high heat. Cook 6-8 meatballs in batches for 3-4 minutes, turning occasionally to cook on each side. The meatballs will be be slightly caramelized when done. Drain the cooked meatballs on a clean sheet of kitchen paper. If baking - preheat the oven to 350F and place about 12 meatballs on a baking sheet lined with parchment paper or silicone baking mat and bake in the middle rack for 15-20 minutes. 1. Place the orange juice in a small thick bottomed saucepan and heat on medium-high heat for about 5-6 minutes and reduce to 2 tablespoons. The final reduction should be able to coat the surface of the pan as a very thick liquid. Remove from stove and allow to cool completely before use. 2. Place the egg yolks in a large mixing bowl. Add the garlic clove and orange zest and whisk vigorously until creamy and pale for about 2 minutes. Then add the salt and whisk vigorously for another minute. The mixture should start to thicken. 3. Whisk in the reduced blood orange juice followed by the lemon juice as vigorously as possible. Then slowly trickle 1 tablespoon of the olive oil while whisking fast to incorporate the oil. Then whisk another tablespoon of the oil into the mixture. Then slowly trickle the rest of the oil from the side of the mixing bowl while whisking the mixture as fast as possible. Whisk in the pepper and taste and season the aioli if necessary. The aioli will be thick and creamy in texture. The color of the aioli will depend on how red your original blood oranges are. yields: I'm giving general instructions on how to assemble the sandwiches with no amounts listed. Feel free to add how much you want to make up the final sub. 1. Pull out some of the soft inner bread to make a little well in the center of the baguette. 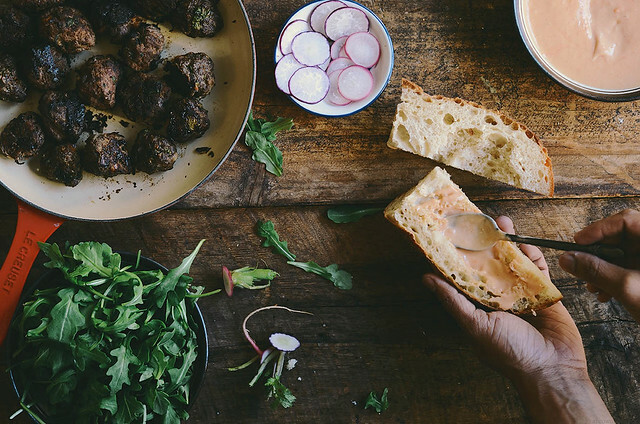 Layer with a generous amount of arugula leaves, radishes and place a couple of meatballs. Drizzle with blood orange aioli and season with a little salt and pepper. Serve immediately.